As anyone who works in social sciences knows only too well, the activities of human beings are difficult to measure and assess, as they are subject to so many variables that it is often harder to determine the causes and effects than in other fields of science. 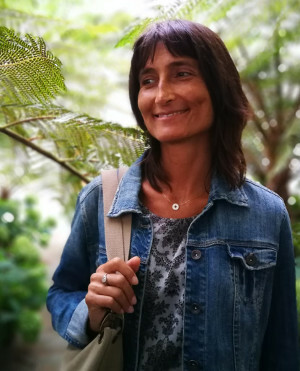 Gema Varona works as a permanent research fellow at the Basque Institute of Criminology and she has overseen three project assessments that could be considered to fall within the scope of restorative justice, in one way or another. Restorative or compassionate justice is one approach to justice which focuses on the needs of the victims and the offenders or perpetrators of the crime, and not on punishments or abstract legal principles. To carry out these assessments, Gema has used various quantitative and qualitative research techniques. Within the events that took place during the European Capital of Culture year, one of the aims of the Donostia 2016 Foundation was to promote peace and harmony.The Adiorik Gabe (“No Farewell”) project brought together 4 artists who worked with the families of 12 victims, mainly including victims of terrorism but also victims of police brutality. The artists performed their work in fields such as music, theatre and even dance, to try to form a connection with the musical and literary memory of the victims. Their performances took place over three public events which paid tribute to the victims and remembered the value of life. Gema designed an assessment of the events, which was subsequently included in a report (“Art, Memory and Justice in Cases of Serious Victimisation:Adiorik Gabe / No Farewell”). The research combined a survey conducted with a representative sample of the 400 or so people who attended each of these events with in-depth interviews with the project’s sponsors and the relatives of the victims (before and after the events in the latter case). With such a sensitive subject, the artists were more concerned about the opinions of the relatives than the people in the audience. For them, it brought home a reality that was far closer than they had thought, especially when they discovered that some of the victims had lived in the same neighbourhood as them or had shared other spaces and life experiences with them. The victims’ families declared that they had enjoyed this type of tribute far more than the others that they had received. Society is eager to move on quickly, while the victims have often suffered a huge impact and they are trapped in their suffering, which is so often misunderstood.They would like their relative to remain in the memory, so that such acts are never repeated against anybody else. Furthermore, the project was even viewed positively by the relatives of victims who were not the subjects of the tributes, as they believed that, in a way, these events were also a remembrance of them. 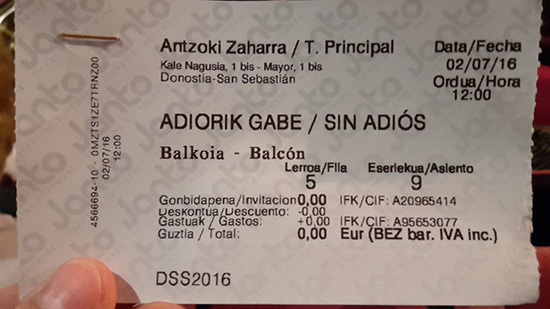 Another of the assessment projects relates to the Basque Government’s GAKOA Programme. An initiative aimed at rehabilitating men convicted of gender-based violence. The sentence is suspended in return for the offender attending a treatment programme with psychotherapists. The aim is to prevent any such behaviour in the future by the aggressor. The programme was analysed at several levels.Firstly, its medium-term effect on recidivism was determined by following up on over 400 cases from the 2006-2016 period. On comparing the figures with those from other regions where the programme is not active, the assessment concluded that the people who take part in this programme have a significantly lower rate of recidivism. “Although it may seem that recidivism rates are quantitative and objective measurements, these findings should be viewed with caution, as whenever we conduct research with people, it is very difficult to isolate all of the variables. 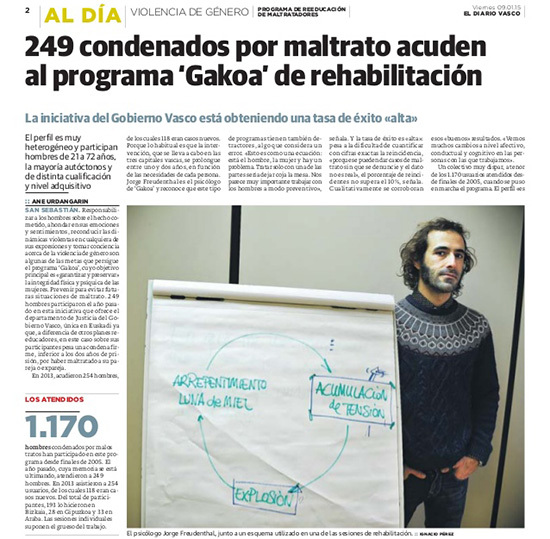 Is it really the programme that is reducing recidivism rates or is it due to the social structures of the Basque Country?Given that we cannot obtain an identical sample of people who did not receive the option to enter the programme, we cannot be sure that the difference is only due to the effect of the Gakoa programme. However, they are a strong sign that the programme works, and there were also other positive results obtained during the assessment", remarked Gema. In this regard, the qualitative analysis of the programme involved 43 interviews and 4 discussion groups with professionals in the legal field, people convicted of gender-based violence, psychotherapists, etc. They also wanted to find out society’s opinion in this regard, as with this type of crime it is easy to succumb to “punitive populism”, an attitude that rejects reintegration measures and focuses on punishments. To resolve the latter issue, a survey was conducted with 558 young people from the Basque Country and it was found that, generally, among other measures, there is support for this type of programme within this section of society. The complete findings of this study will be presented at an open conference at Bizkaia Aretoa on 12 and 13 November 2018, although they have already been debated at the International Victimology Symposium in Hong Kong in June 2018. Following the selection of the Basque Institute of Criminology (IVAC/KREI) to organise the next Symposium in 2021, it will be hosted in Donostia/San Sebastian. The final assessment project is currently underway and relates to the activities of the Collaborative Law Association of the Basque Country. Collaborative law is an alternative method of resolving disputes, which focuses on the needs and interests of the parties concerned and is based on team negotiations between lawyers, clients and other professionals (notaries, economists, labour relations specialists, psychologists, psychiatrists, educators, coaches, mediators, arbitrators, therapists, etc. ).The collaborative lawyers involved agree not to represent their clients if the process fails and ends up in court. The association was established in 2013 and it was one of the first organisations in the country to start advocating this form of justice. The Basque Institute of Criminology has undertaken an external assessment of its activities this year.Based on the external assessments of similar organisations in other countries, the methodology of this procedure will involve questionnaires, in-depth interviews and discussion groups with lawyers, clients and judges, with partners also being surveyed. 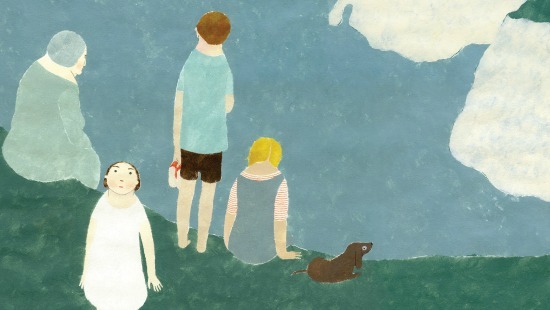 “One element that it has in common with the other two projects is the inherent, epistemological and methodological difficulty of performing this kind of assessment.We are dealing with intangible issues that go on to have concentric social effects, beyond the clients involved in the processes”, explained Gemma. 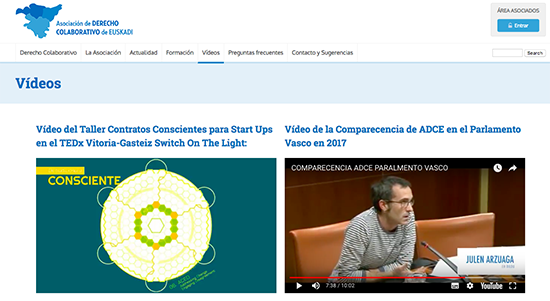 In this article, we have seen projects in which an organisation such as a foundation, an institution like the Basque Government or even a private association comes to the university to find a specialised and independent external organisation that is able to assess their activities using research techniques. This is another way in which the university can have a presence by transferring knowledge to society, in this case in the field of criminology.Unlike other, basic and purely academic research projects, which are sometimes seen as being for internal consumption or self-reference, knowledge transfer projects tend to have greater visibility - without losing their scientific rigour - because they affect other stakeholders. “And when the focuses of your research are abstract and intangible concepts such as restorative justice and social harmony, knowledge transfer projects are seen as a way of making your work tangible, taking it outside the realm of the abstract and seeing how it affects people", remarked Gemma.However, “with this type of project, companies and institutions often prefer to hire consultancy firms to conduct the research instead of the university, as they are far less bureaucratic organisations.Fortunately, with knowledge transfer projects we have a simple mechanism to channel this research.At least I find that it is very easy to conduct it through Euskoiker.It works extremely well; they offer a professional and personalised response and they help to resolve any problems”.